Powerful is a word that should not be used lightly. In the case of the Advanced Foot Energizer, we can truthfully say that it has the potential to make a powerful difference in your life. Like most people, you probably would enjoy being able to put in a full day’s work and still have the strength to engage in the activities you love: hiking, biking, an evening out with friends. But, unlike most people, you have aching, pain-filled feet and legs and you just can’t do it. But there is a powerful (there’s that word again) answer…and it doesn’t include pain medications which can be harmful to your long- term health. Save 10% on Advanced Foot Energizer. Join Email Club for code. 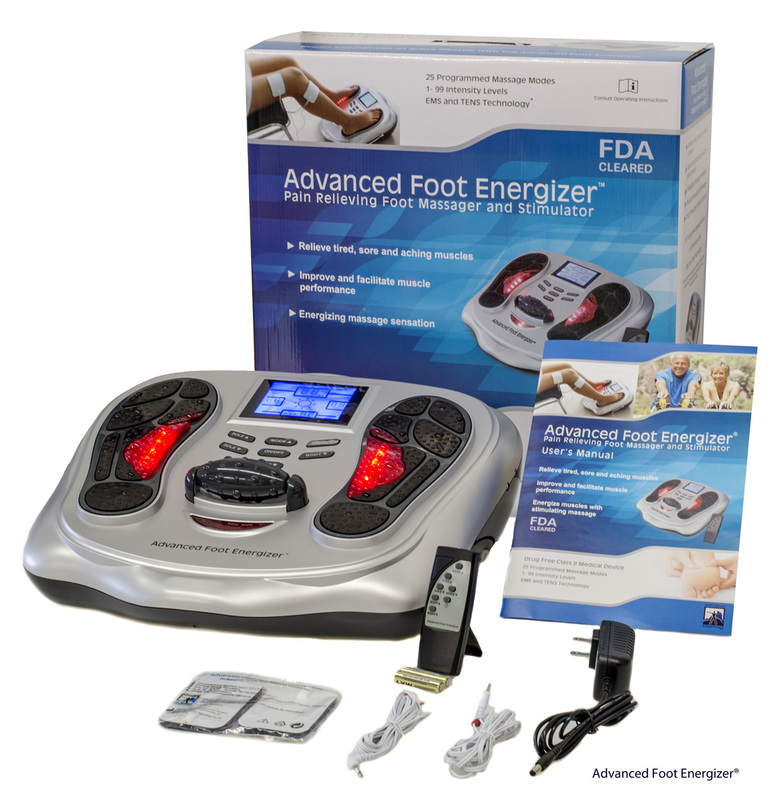 The Advanced Foot Energizer, from Northwest Essentials, soothes your tired and pain-filled feet and legs through proven electrical muscle stimulation (EMS) and nerve stimulation (TENS). These forms of stimulation actively motivate the muscles and nerves in your feet. The machine contracts and releases your calf muscles, drawing the blood down to your feet and legs, and pulls toxins away. 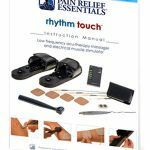 By using a combination of modes that include EMS and TENS, the Advanced Foot Energizer is able to block pain signals to your brain and improve and facilitate muscle performance. Clinically- proven EMS massages and strengthens your feet and legs while improving muscle performance. TENS mode effectively blocks pain signals to your brain which relieves the pain associated with sore and aching muscles from exercise or normal household work activities. With 25 modes and 99 intensity levels, you can choose the most effective massage for your individual needs. Using the Advanced Foot Energizer regularly will have a dramatic effect on your feet and legs…and wherever you have aches and pains. How does the Advanced Foot Energizer work? 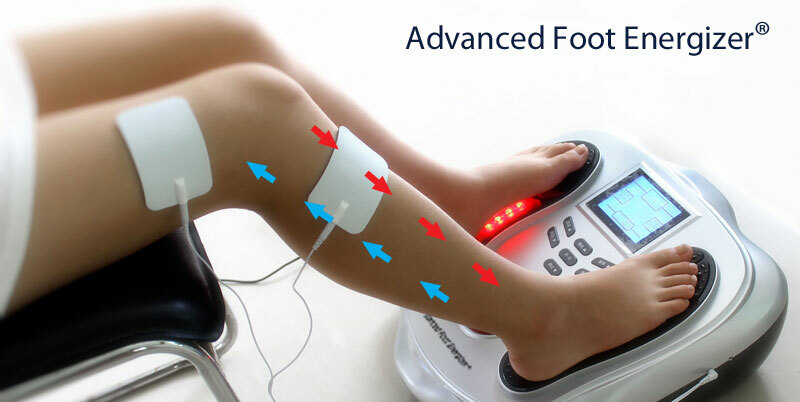 More than just a circulation booster, the Advanced Foot Energizer uses both Electrical Muscle Stimulation (EMS) and Transcutaneous Electrical Nerve Stimulation (TENS) technology. This technology has been in use by physical therapists, hospitals, and other health care practitioners for over 50 years. The special electrode silicon area (foot pads) for each of your feet ensure that the muscles in your feet and legs are stimulated causing your muscles to contract and release. During stimulation, signals are sent between the foot pads. These signals reach out to the nerves or muscles in your feet and legs. Your leg and feet muscles then contract and relax with a gentle rhythm. The benefits include increasing your circulation in your feet and legs, easing tiredness, and alleviating your aches and pains. Also promotes increased blood flow and reduced swelling. 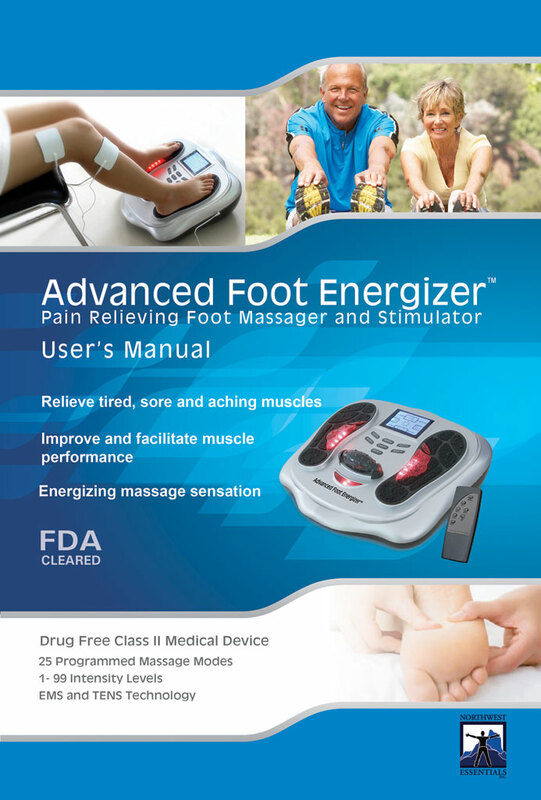 As a Class II medical device cleared for sale by the FDA, you can rest assured that the Advanced Foot Energizer meets the stringent guidelines required for legal sales in the United States. 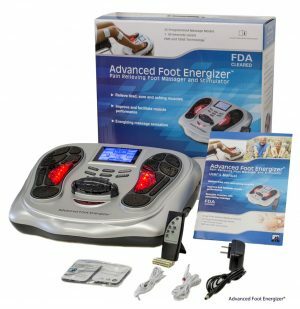 Is the Advanced Foot Energizer easy to use? 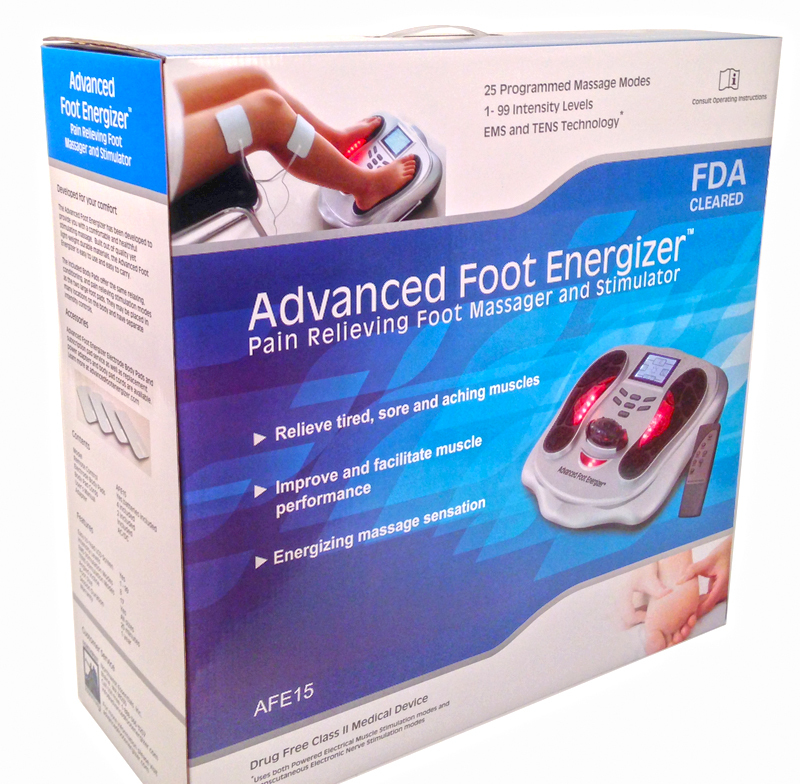 The Advanced Foot Energizer is one of the easiest tools available that renews the energy in your feet. Often we assume that technology will have to be monitored or utilized with supervision. This is as easy as slipping your feet into a pair of bedroom slippers and turning on your TV with a remote. Also, the 25-minute timer automatically shuts the energizer off. It’s that simple…and that powerful! 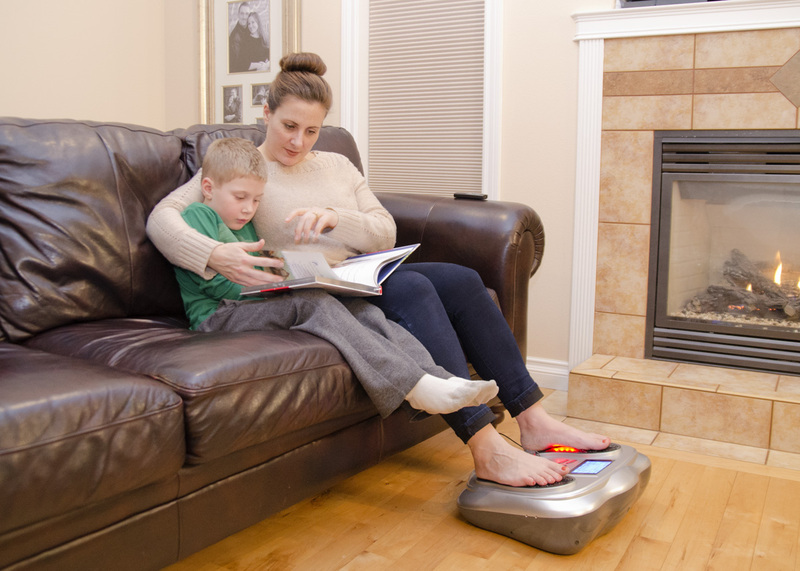 Because we are convinced that you will love the energizer, we are offering our risk- free, no-hassle, 60-day guarantee for the Advanced Foot Energizer foot massager and stimulator to allow you ample time to test your investment in your health. You can be just as pleased as John. It’s literally a matter of ordering the system today. Check more testimonials like this one from Suzan B. And, if you are not completely satisfied with your Advanced Foot Energizer with 60 days of continuous use as instructed, just let us know and we’ll promptly provide you with a full refund. Questions? Read Frequently Asked Questions Here. 60 day return policy – Try it for 60 days risk free! Do not use the Advanced Foot Energizer TENS and EMS electrical muscle stimulator if you wear pacemaker; do not use on vital parts, such as carotid sinus nerves, across the chest, or across the brain; use caution in the use during pregnancy, menstruation, and other particular conditions that may be affected by muscle contractions; potential adverse effects may include skin irritations and burns. Remember, prescription-strength neuromuscular electrical muscle stimulation literally blocks pain signals to your brain while conditioning your muscles and rejuvenating them. With repeated use, you will soon be able to get back on your feet and get back to the lifestyle you want to live. It will make a profound and powerful difference in your life. * Free standard ground shipping & handling worth up to $30 for deliveries within the contiguous US only. Orders shipped by ground normally arrive in 2-3 business days to the east coast and 2 – 3 business days to the west coast. Your Advanced Foot Energizer will be shipped out of a warehouse in Tennessee, Utah, or Washington State and most orders ship by FedEx Ground or FedEx Home Delivery. Orders shipped to Canada will process through customs and may have duty and taxes added at the destination. Devices in Class II are held to a higher level of assurance than Class I devices, and are designed to perform as indicated without causing injury or harm to patient or user. When I first heard about this machine I was intrigued. After much research on similar machines I was convinced that this one would be a great investment in my own health. 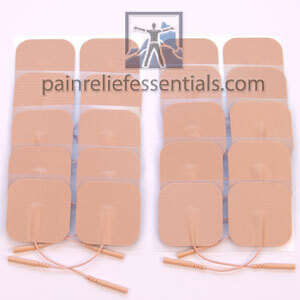 After speaking with Kevin at pain relief essentials I negotiated an outstanding deal to get it. Within 2 days my AFE arrived and after reading the instructions soon had my feet on the foot pads. Within a half hr. I was convinced that I had made a great decision. Now, a couple of weeks later I am still convinced that this device is well made and well thought out for daily use. I highly recommend it for anyone who can use a reflexology foot massage on demand. We are so happy that we bought the advanced foot energizer. We looked at a few different machines and decided that choosing one with FDA was important to us. And based on some of the reviews we saw for other machines we were very happy we did. This machine came with instructions that are easy to read and understand. It helps my feet by stimulating the nerves and improving sensations. My husband has diabetes; uses it twice a day and he loves it. He uses it in the morning and before going to bed. He believes it has helped his circulation and seems to have better balance. I recently sprained my ankle, and the first few times using the machine, I was not able to feel anything on my injured foot, but now I am! Highly recommended. 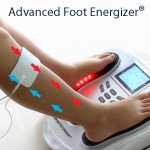 I purchased an Advanced Foot energizer a few months ago for my aching feet and lower legs. I stand all day for work and over time my feet and lower legs were feeling the affects. I use it about 8 times a week. 1. The first thing I noticed is the dull ache in my feet reduced right away. I couldn’t feel it so much the first few times I used it, in fact I had the power turned all the way to maximum (99). After a couple uses it felt stronger, I now use it at about 70 and it feels good. I am very thankful for the Advanced Foot Energy I highly recommend it.